Guess what? I already have the book even though I don’t need another cookbook either. It’s gorgeous, and I can’t wait to bake from it. I guess it’s cheaper than collecting designer purses, right? 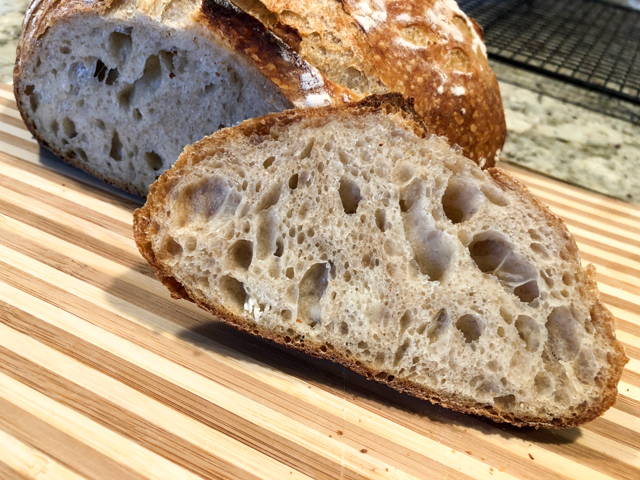 Your crumb is perfection, and I love the loaf with the blown out side! Bogey doesn’t care! So nice to “see” you here! Wow, I’m struggling with extreme fatigue but I will fight through to give Emilie’s recipe a try. It looks gorgeous. Celia has taught me so much and now Emilie? We’re in for good bread. Wonderful to have you stop by…. 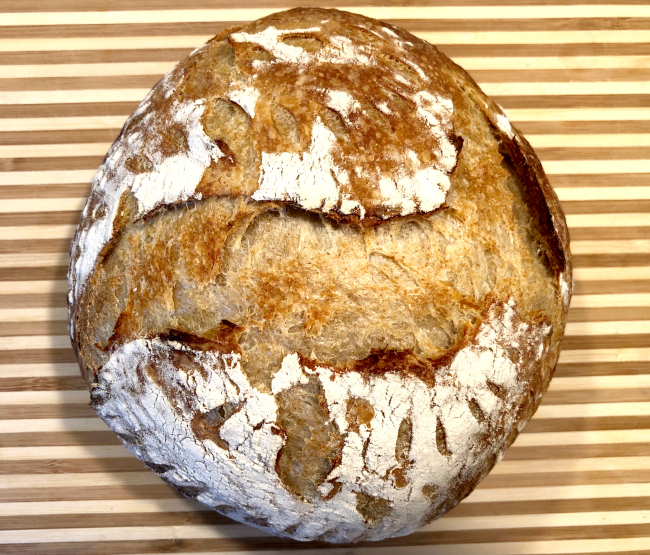 if you are dealing with fatigue, maybe this is the bread for you, don’t even need to fold it, you’ll have a gorgeous loaf! A wonderful post! Emilia, her blog and her book are all fab, but most of all I love your loaves and all of your slashing!! 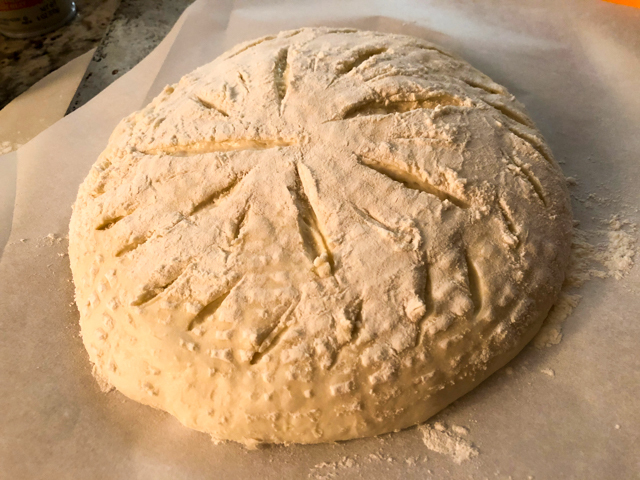 I love the anticipation of not knowing exactly what the slashing will end up looking like…that moment of hope when you lift the lid on the baked loaf and just pray that it’s risen, and HOPEFULLY also looks good!! Another here who needs a new cookbook like a hole in the head – and the postman has just brought me Solo by Signe Johansen. It looks full of really great ideas to make interesting food for one. I am also a great fan of Celia’s blog and having read about Emilia’s book there I have got it on my kindle too. It may seem odd to bake my own bread when I live alone but I slice and freeze my loaves and that works well. A home made loaf always makes a welcome gift too. Might have known Bogey would be paying attention – but I don’t think it was the slashing he was interested in! that Bogey is something, isn’t he? He is totally tuned into the noises around the kitchen – if we grab a knife from the storage place, even if we try to be as silent as possible, he might be deep asleep, his ears go up, and in one nanosecond he is right by our side! 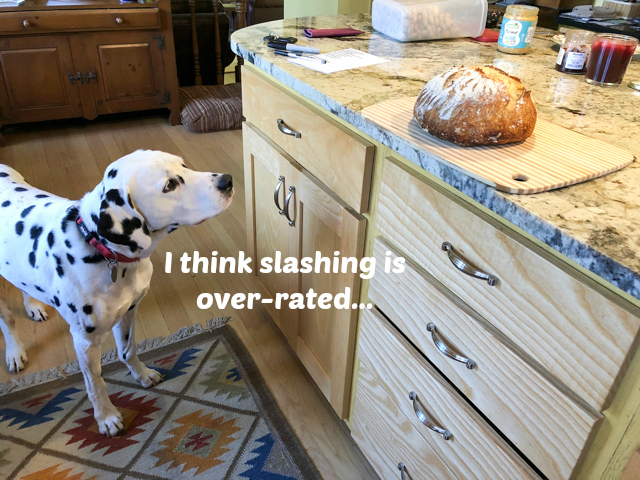 I agree, your slashing is fantastic! I’m still scared of it ;P I bought Emilie’s book too thanks to the lovely Celia’s mention of it on her blog. I was lucky enough to have had sent some of the lovely starter “Priscilla” from her which I’ve had for some years now. 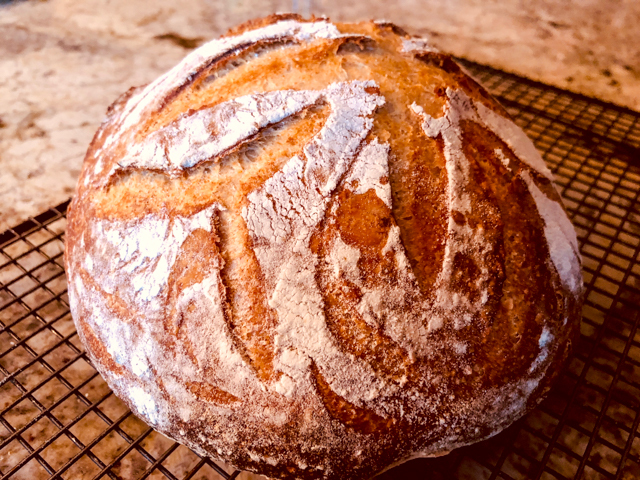 She’s the perfectly behaved sourdough starter that I called “Eve” since I expected problems 🙂 I’ve even dehydrated her while in Europe the way Celia explained and she came back better than ever!!! I’ve made Emilie’s first recipe in the book, the everyday sourdough and wow it was probably the best loaf and easiest I’ve made so far. On to this one you are showing us today maybe next week. I have a black olive batard to attempt first in my new banneton but it’s not a sourdough. Please wish me luck! Good luck! I will be holding your hand, virtually every step of the way……..
That is some incredible bread you got there! I loved the slashing comparison (and the comparison to trilobites, lol). 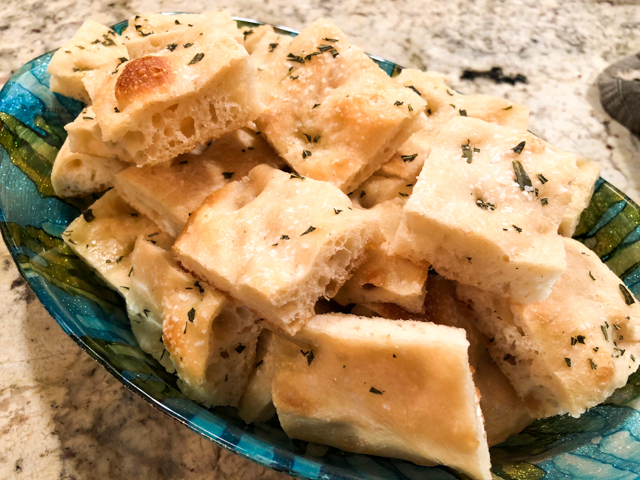 But by far, my favorite is the focaccia. That may the thing that nudges me into finally trying this monstrocity of a loaf. But first…can I borrow a scale, a thermometer, a hydrometer, a hygrometer, and some starter? Thanks! Forgive my ignorance, but what’s a “DO”? I bought myself a cherry red Le Creuset enameled dutch oven in more affluent days. 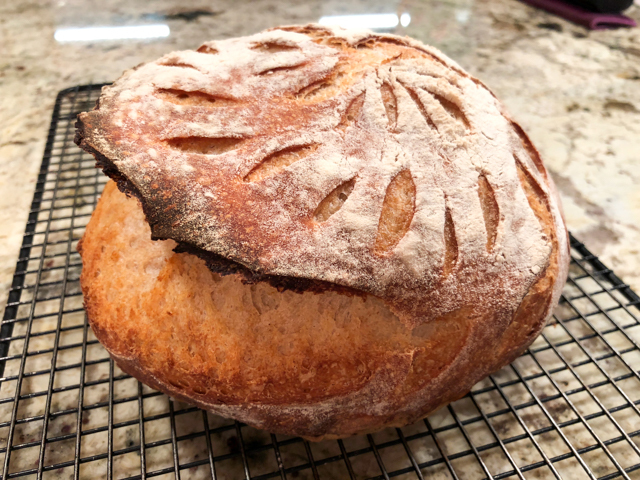 It’s used to help create a very hot steamy environment in the oven during baking so as to produce maximum oven spring … not that I’ve been overly successful in the pursuit of that so far. 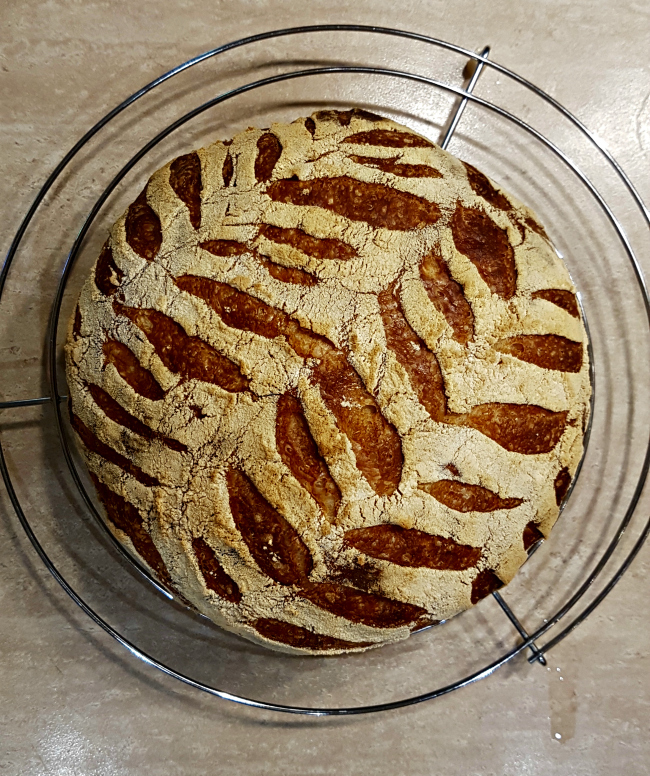 soda breads… huuummmmm…. I might have to try that in my D.O…..
Here’s a pic (just scroll past the stupid story): https://dangerdangerwordpresscom.wordpress.com/2017/03/17/oleftovers/ . I’m doing that again this year. 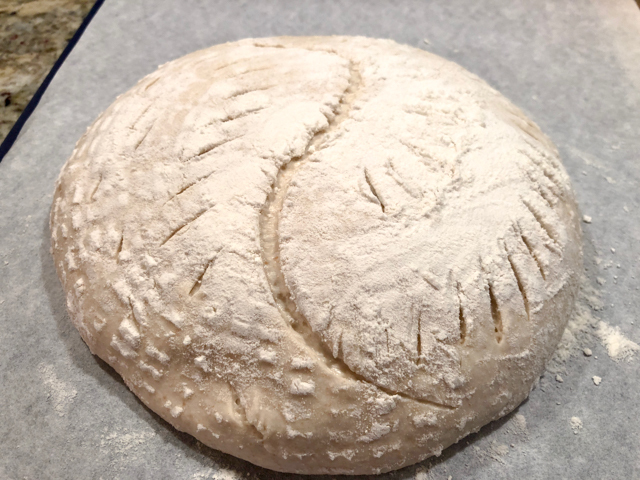 I don’t bake soda breads often … maybe once a year in March when I try to come up with an Irish themed meal to switch things up for the season. I’ve been meaning to make colcannon (or colcannon light with shredded coleslaw mix) for a while now. I’ll have to try baking the soda bread in the dutch oven. Thank you for the idea. 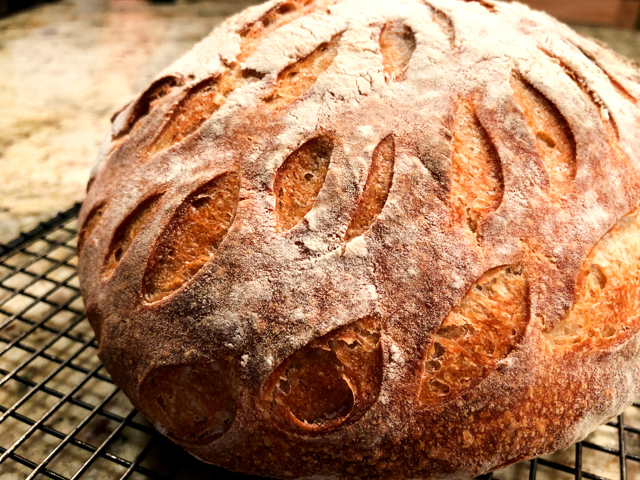 Oh, I’ve tried making no knead bread … once. 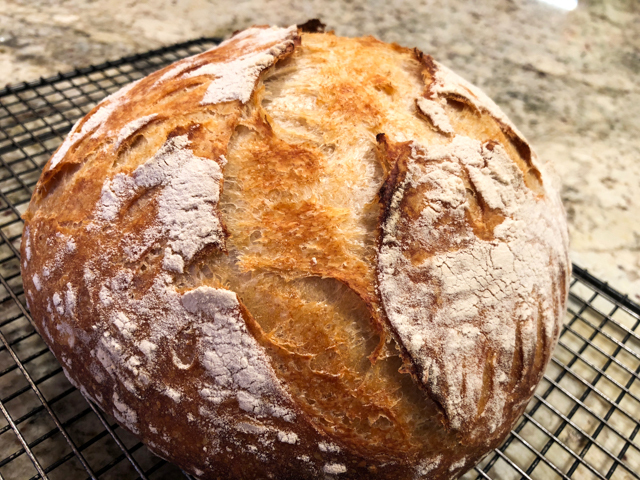 I don’t actually mind kneading though there’s a sourdough no knead that I’ve made about 10 times over the last year or so. 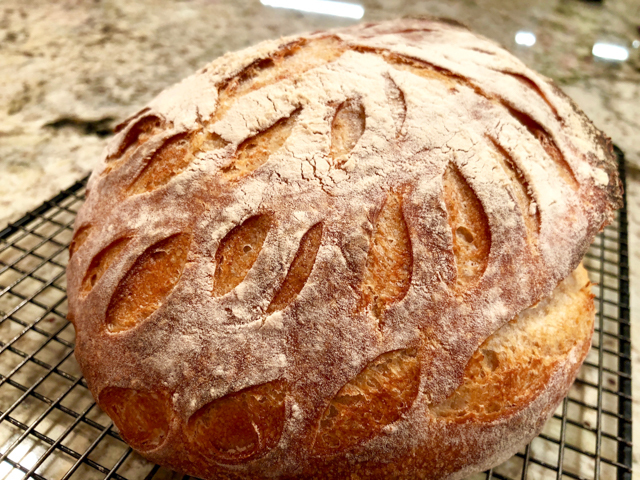 I bake for just me and don’t usually eat that much bread … only when I try out new recipes when I get bored. Cause baking bread is inexpensive. And fun. Duly noted. Will just have to lay toilet paper around my kitchen again and see when it looks damp (remind me to use UN-used toilet paper this time). Next question? Ok: what the hell is going on with Lula?! oh, man… Lula… I have to tell you that my mind is so upset with what we have in the US of A that I do not have the space or the intestinal fortitude to focus on what is going on back home. I can tell you hell is breaking lose, Rio de Janeiro’s violence is hitting unprecedented levels, everyone is upset, frustrated, and no light is seen at the end of the tunnel. We will be there next month…. I might be able to tell you more later..
I’ve actually been having to keep up with news out of Brazil as part of my job, and you’re right: very upsetting on many fronts. Such a beautiful place, such a rich culture. Such a shame. I hope things smooth out for everyone’s sake, and soon. No new cookbooks for me either but I DO appreciate having people cherry pick outstanding recipes like you have and sharing them. 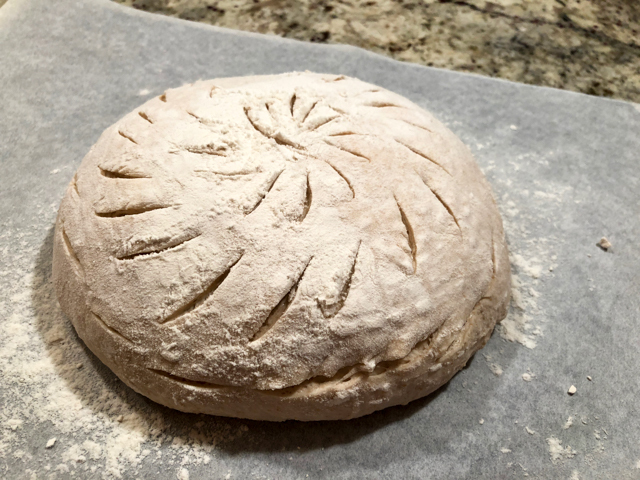 I haven’t had much luck with high hydration doughs in the past so I have pretty much stuck to one particular no knead and a tartine recipe for my SD baking but I’m going to save this one and give it a try. Thank you. I can’t get the hang of slap and fold. Stretch and fold is about as much as I can manage. I sure as heck don’t need another cookbook, but since I was just thinking about getting into baking bread again using a short and simple recipe that I downloaded, I took a look at this book and bought it instead. Thanks for the heads up Sally. wonderful! You will love the book, I am sure! Haven’t read that! will investigate…. 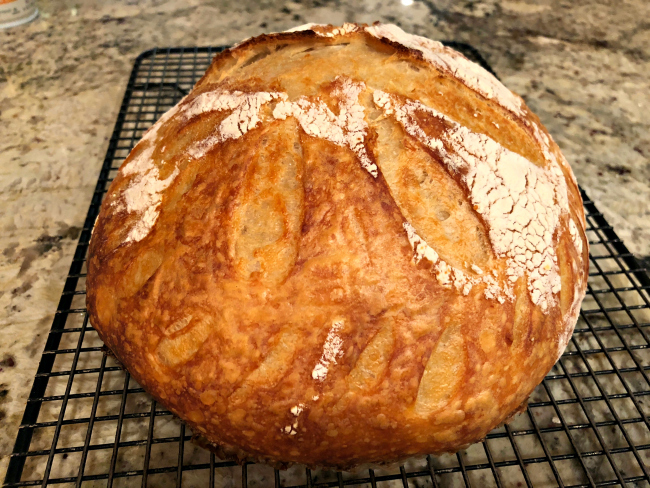 Beautiful bread!! All of them are! Slashing can be so tricky but I think yours is wonderful! Sally I finally got around to making this loaf today and it came out great. I even attempted to do the bird wing slash pattern out of the book and I’m pretty darn proud of my first attempt! THAT IS FANTASTIC!!!!! Thrilled for you, and thanks so much for letting me know! My Saturday starts even better for that! I’d love to show you Sally. I took a photo. What is the best way? 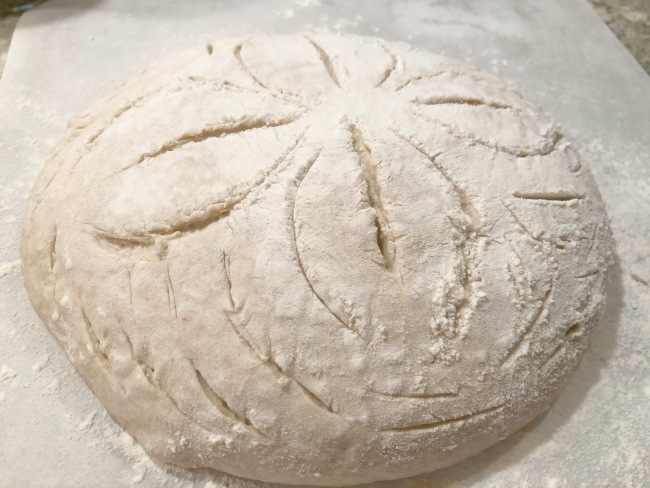 Do you put the dough in a COLD baking pot?